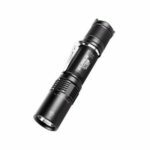 The KLARUS XT12GT has an impressive maximum output of 1600 lumens from the Cree XHP35 HI D4, and provides the higher output. 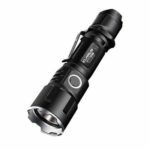 The perfect addition to the XT series, the XT12GT is compact and easy to use with just on hand. The multifuntional dual switch which provide access to different output levels for tactical or outdoor use. 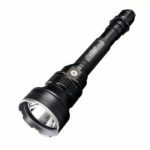 Super bright, ultra long-range, the beam can reach over 603 meters with maximum 1600 lumens. Improving on the classic KLARUS XT series for self-defence and law enforcement applications. Instant STROBE anytime for enhanced self-defense in emergency situations. Patented dual tactical switch for non-visual, one-handed touch operation. The primary switch: one-touch access, ON/OFF, constant-ON; mode switch: one-touch strobe, one-touch low, mode change. Specially designed for the wilderness. With multiple output levels with memory: one-touch low, one-touch turbo and SOS modes. 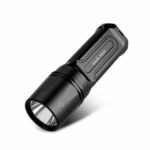 Suitable for all needs in hunting, hiking, camping or search and rescue. When in OFF mode, press and hold primary switch for 10 seconds. Indicator light will blink to indicate ready. Press the primary switch to change between tactical and outdoor settings. When flashlight is initially turned on, the battery indicator light will flash for 5 seconds then turn off. Comes with high-performance Panasonic 18650 3600mAh cell core, also compatible with CR123A battery. 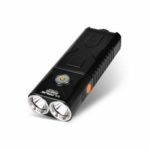 Only when using KLARUS 18GT-36 3600mAh battery or the same batteries of the other brand, the Max output could be up to 1600LM; When using the normal 18650 battery with PCB protection or 2 x CR123A batteries, the Max output could be only up to 1300LM.